Every coach asks himself the question how he wants his team to play. Everything you see on the playing field is related to the style of play; it’s the way the style of play is executed. Each coach decides, after weighing various options, to choose a specific style of play and a related game tactic. At the beginning of the season one starts to build on that style of play, which can be adjusted accordingly based on game analysis and results. Then, you must decide on what formation your team will play: does the midfield play with the point forward or the point backward? Or, if you elect to play with four midfielders: in a diamond, or with two controlling midfielders and two wide midfielders? In each team-organization or formation many variations are possible. Thirdly, we have to decide what the basic tasks are that the players must fulfill within the chosen style of play. These tasks can vary game by game and are mainly dependant on the opposition. Beyond that, it is very important to keep the balance in the team: do we have enough defensive minded players, enough left sided players, how are we doing length-wise and speed-wise? Once the defense is structured we can start to think about the offense. A great example is the Champion’s League Final in 2005. In the first half Liverpool were toyed with by AC Milan. Liverpool coach, Benitez, switched a player at halftime and the balance in the team was found, which turned the game around. Thanks to a historical comeback Liverpool was able to take "the cup with the big ears" back home. Immediately at the first practice of the pre-season a coach is working on a strategy of how to play - basically a coach is developing a style of play. Constantly, each and every part of practice should be related to the specific style of play. At a higher level, one must definitely keep the opponent in consideration. Knowledge of the various styles of play is essential to be able to prepare your team for the next game. The analysis of the previous game, together with your team, plays an important role in this process, just like the practice that follows the game. One always works on the development of the style of play to improve the level of the team and to be able to win the next game(s). Many Dutch coaches say that they never adapt to the opposing team. But there are plenty of examples of little adjustments, in the main formation, that provide for a stronger defense, better transition and more effective attacks against a specific opponent. Each coach must take account of the fact that each time there are eleven different players opposite his own team, all playing in a specific formation and with different qualities. If one isn’t prepared for this, and doesn’t adjust to it, then the consequence could be a bad result. The opponent (the yellow circles in the drawing) plays 1:4:3:3 with their midfield playing with the point backward. 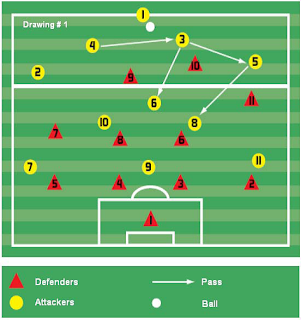 Your team (the red triangles in the drawing) plays 1:4:4:2 with two defensive midfielders. 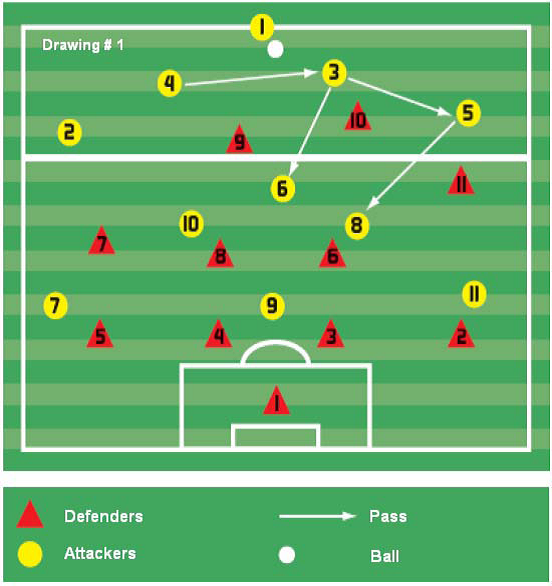 The opposing team builds-up through the defenders 3, 4 and 5, whom mainly try to reach the central midfielder (#6). It is important to know when you start to apply pressure: At the midfield line or on your own half of the field or the opponents? How do you stop #6 from having too much freedom to handle the build-up? Do your attackers (9 or 10) pressure him or does one of the midfielders (6 or 8) move upwards? What are the consequences for your team if you do this? If you do win the ball what are your possibilities offensively, or are you limited because of the way you were covering #6 on the other team? The various options can all be practiced with the team. The players then have to make the correct choices during the game; the coaches’ influence is very limited at that time and point. Practice as many possibilities within your team’s own style of play and constantly offer the possible solutions.